Why not treat yourself to a trip on one of Europe’s most scenic trains through the Swiss Alps! The Glacier Express Train in Switzerland is an iconic train that offers panoramic carriages in which you can view the Swiss Alps. This train operates between Zermatt via Davos to the town of St.Moritz and passes through some of the most scenic towns and landscapes in Switzerland. The journey takes around 7 hours and passes through deep gorges, delightful valleys, 91 tunnels and across 291 impressive bridges. 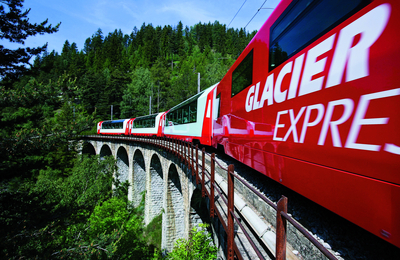 The Glacier Express train is a very popular service and is subject to availability. Prices include VAT, but exclude seat reservation fees. The seat reservation is compulsory on board the Glacier Express. These cost £19pp in the winter timetable and £35pp in the summer timetable. The fee must be paid in full by all passengers, including children and others holding discount travel passes. This does not apply to children under six who do not require a seat. Holders of all TCV and Eurail passes must also pay the fee.